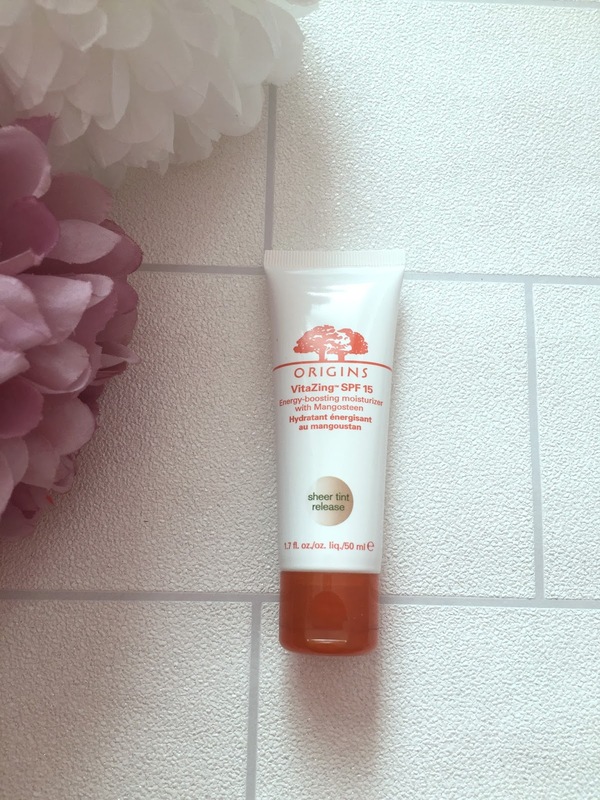 You may have seen my recent post on the Origins Mix & Mask Box, the beauty box full of Origins face masks. 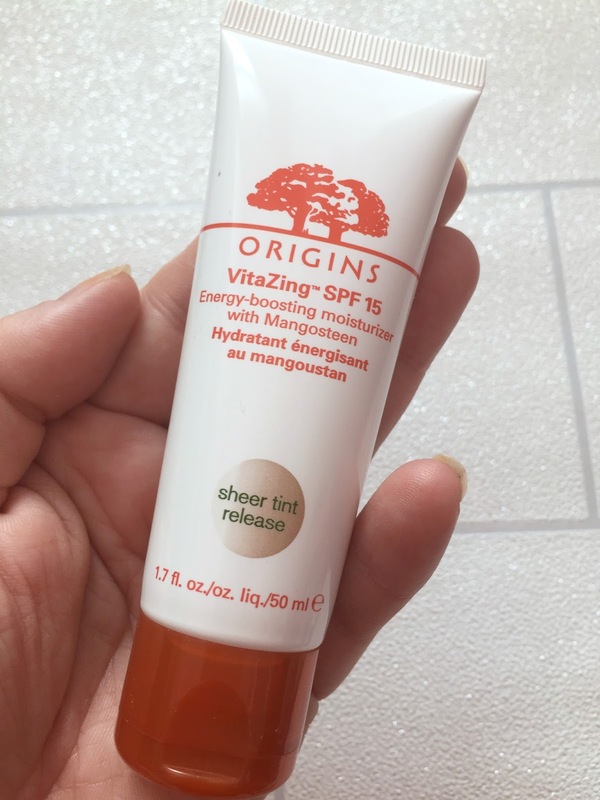 In the box amongst the face masks was the Origins Vitazing, I have been using the Vitazing since I received the box and today I am going to let you know my thoughts on it. This energising, multi tasking moisturiser gives skin instant vitality and vibrance with the zing of vitamin rich Mangosteen Energy Complex. Magically transforms, protects and perfects to create even, flawless skin, SPF 15, oil free. 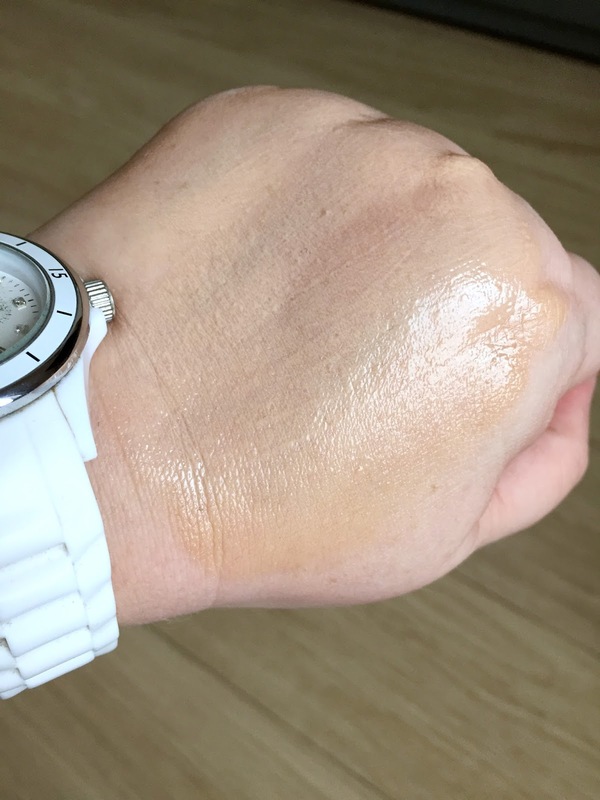 I love this product and have used it non stop since I got it, it is definitely a tinted moisturiser and not just a regular moisturiser that you would use twice a day, Vitazing is a white coloured fluid with tiny flecks of grey/brown in it and when rubbed into the skin it changes to adapt to the colour of your skin, it has a lovely scent and blends out onto the skin really well. I have been using Vitazing as my base product, it is the perfect light summer base for me, it doesn't provide any coverage at all and is definitely a tinted moisturiser and not a light coverage base product. I have used the Vitazing every time I have applied my makeup since getting it and I really like the look it gives me. I use either my hands or a buffing brush to work it into my skin and use some corrector and concealer under my eyes and concealer if I have any blemishes or other area's that need concealing, I use a light loose translucent powder and that's me done and I really like the effect I am left with. Vitazing would be great for days when you don't want to wear makeup and just want a bit of a pick me up or for the school run or like me if you're someone who doesn't like to feel foundation on their skin in the summertime, it would also be brilliant on holiday, it's a great product that just evens everything out and adds a nice tint and glow to the skin and I absolutely love it and will definitely be re purchasing it once it runs out, I would imagine that won't be for some time though since a little does go a long way which is also brilliant. 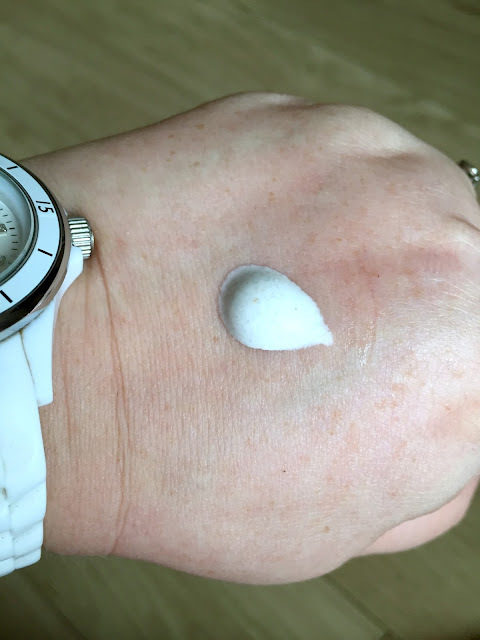 I have extremely dry skin and the Vitazing on it's own as my moisturiser wouldn't be enough for me, I apply it after I have applied my regular skin care and added my primer but if your skin isn't as dry as mine you would be fine with this as your moisturiser and base product saving both time and money. The Vitazing also has an SPF of 15 and doesn't contain any parabens, mineral oil or synthetic fragrance. A full list of ingredients can be found here should you require it. 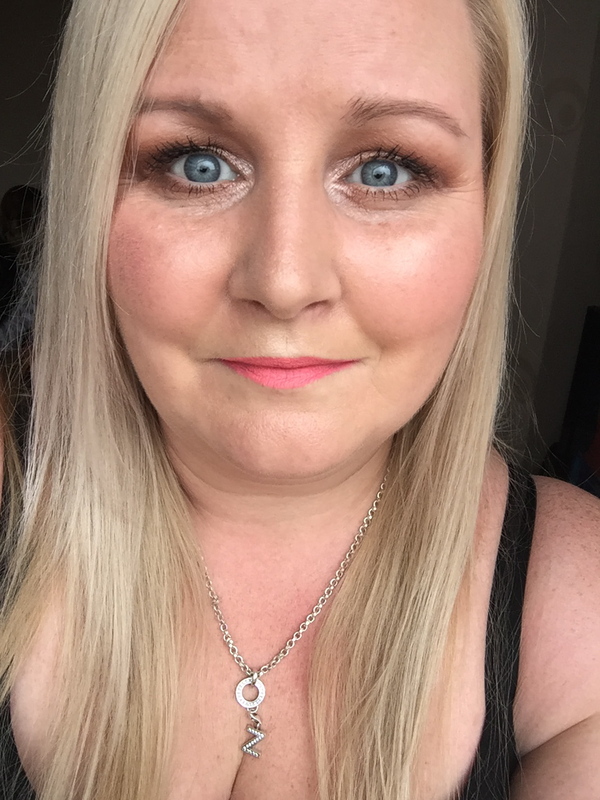 I am wearing the Vitazing in the photograph below, I have applied it as always and added translucent powder, blush and highlight. I cannot praise the Vitazing highly enough, I love it and I completely agree with the description given by Origins. Vitazing has been my perfect base for the last few weeks and will continue to be for the foreseeable future until I feel I need something with a bit more coverage but for now it is perfect and I shall continue to use it. If you would like to try the Origins Vitazing, you can find it on the Look Fantastic website HERE for £29.00 including free delivery. 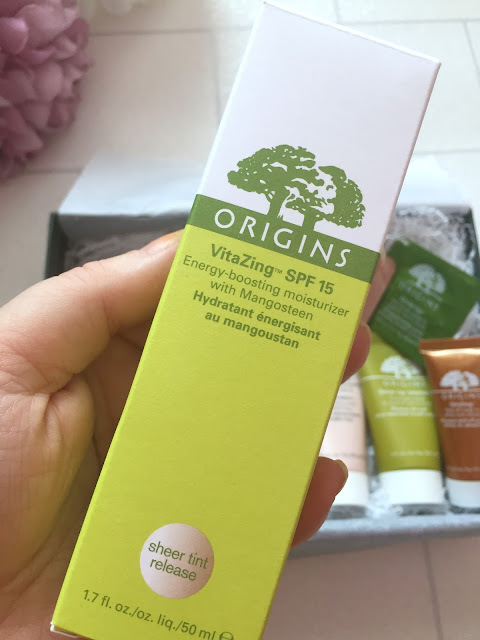 Have you tried the Origins Vitazing? What is your perfect summer base product? Let me know in the comments section below.